The Chinese hare (Lepus sinensis) is a species of mammal in the family Leporidae. It is found in China, Taiwan and Vietnam. The Chinese hare was first described by John Edward Gray in 1832. 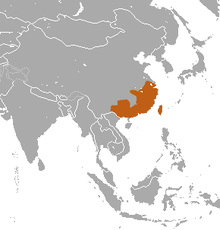 The Korean hare (Lepus coreanus) was at one time considered to be a subspecies of the Chinese hare but molecular studies of mtDNA have since shown that the Korean hare is in fact a separate species. The Chinese hare is a small species growing to a length of about 40 to 76 centimetres (16 to 30 in) and a weight of 1.25 to 1.94 kilograms (2.8 to 4.3 lb) with the females being rather larger than the males. The fur is short and coarse, the back and chest being chestnut-brown and the belly whitish. The large hind feet are furred, the tail is brown and the tips of the ears bear triangular black patches. It is distinguished from other Lepus species by the shape and details of its skull and teeth. The Chinese hare is native to the provinces of Anhui, Fujian, Guangdong, Guangxi, Guizhou, Hunan, Jiangsu, Jiangxi and Zhejiang in China. It also occurs on the island of Taiwan and in a separate small area of northeastern Vietnam. The Chinese hare has been little studied but like other hare species, the diet consists of grasses and other green plant material, buds, twigs and bark. It is mainly nocturnal and produces two types of faeces, moist and dry pellets. It eats the moist pellets immediately so as to extract the maximum nutritional value from its food. It does not live underground in a burrow but has a form or nest in long vegetation. A litter of about three precocial young are born in this and visited by the mother once a day for a few minutes to allow them to suckle. The mother's milk is particularly rich in protein and fat and the lactation period lasts for about three weeks. Various carnivores prey on the Chinese hare and it relies on its fast running speed to escape from predators. The IUCN lists the Chinese hare in its Red List of Threatened Species as being of "Least Concern" as it has a wide range. However, in Vietnam it occurs in a heavily populated area and is at risk from hunting. In China, its population trend is unknown. 1 2 3 4 Smith, A. T.; Johnston, C. H. (2008). "Lepus sinensis". IUCN Red List of Threatened Species. Version 2013.1. International Union for Conservation of Nature. Retrieved 2013-09-06. ↑ Hoffman, R.S. ; Smith, A.T. (2005). "Order Lagomorpha". In Wilson, D.E. ; Reeder, D.M. Mammal Species of the World: A Taxonomic and Geographic Reference (3rd ed.). Johns Hopkins University Press. p. 203. ISBN 978-0-8018-8221-0. OCLC 62265494. ↑ Hung Sun Koh; Kyung Hee Jang (2010). "Genetic distinctness of the Korean hare, Lepus coreanus (Mammalia, Lagomorpha), revealed by nuclear thyroglobulin gene and mtDNA control region sequences". Biochemical Genetics. 48 (7–8): 706–710. doi:10.1007/s10528-010-9353-0. 1 2 "Lepus sinensis - Chinese hare". Living organisms. Wildpro. Retrieved 2013-08-28.